Over the past few months Gemma and I have been counting down a number of things. Number of days left in Toronto, how many days of Work left, time before we arrive in Europe, number of days remaining on our trip. But none have more agonising for me then awaiting the purchase of my new camera. To be able to reclaim the Federal and Provincial taxes, purchases must be made within 30 days of leaving Canada. That time arrived this past Tuesday so after work I did my best to rid our bank account of some hard earned Canadian dollars and I am now the owner of a Nikon D80. So here are a few quick impressions after my first outing with it to the old Distillery district of Toronto. Once again my dad and Derek are probably the main ones that will enjoy this, if you’re not into cameras maybe just check out the photos on flickr. The handling of the camera is pretty much identical to the D200 I used in Calgary so I knew already I would like that. Having access to all the controls at your finger-tips rather than having to scroll through menus makes things so much easier. It is a little lighter having a plastic body rather than magnesium but still got a bit of heft. The bright viewfinder is great, and large screen with true RGB histogram makes checking exposure and focus a breeze. My old FZ10 (currently for sale on ebay) while competent at most things, lacked a little in the Mega pixels department. Having more than double the resolution, the D80 will definitely improve some of the large prints I intend to make, although is testing the power of this laptop during Post Processing. I picked up a used Nikon 50mm F1.8 AFD lens and have bought the much talked about Nikon 18-200mm VR for my dad (thanks for letting me use it on the rest of the trip!). I have put 3 photos up so far from our day. Click the ‘All Sizes’ magnifying glass button above the photos to see them large, the entire 10MP file are there. The first, as seen above, and this one are of a Doge truck at the old distillery which may have actually been a truck from one of the breweries there many years ago. Both were taken with the 50mm. This is of one of the distillery buildings. They are now all filled with art galleries, resturants and other stores. I’ve never worked with raw files before so I still have a bit to learn. I think I oversaturated the building shot a little but it was very vivid in person. So now I’m all kitted up and ready for Eastern Canada, New York and Europe. Plenty of more things to anticipate still. Hopefully you will see some improvements as I get the hang of an SLR again. I haven’t used one regularly since 1998 when I did Photography in year 11. I’d love to get some feedback from those in the know (or anyone with an opinion for that matter) on these shots and any future ones. Simo – you think you’re been patiently hanging on waiting – in 44 days your Dad will be a “pensioner” and casual teacher and he is not sure if that is something he is really looking forward to! 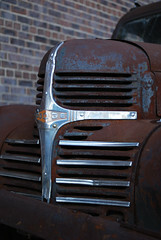 Amazing detail in the Dodge front end image (the rust) and the building (peeling paint). From the look of the steering wheel shot you are going to have to be very aware of the short DOF with the 50mm lens when you are shooting wide open and close up. Julie and I saw the travel agent on Saturday and confirmed our South American trip – looking into actual dates, probably earlier in September rather than later – weather is better then. Let’s wait and see what Dan comes back with hair wise before we start harrassing Simon -another mo perhaps? I look forward to seeing you too, not long now only two more months. I can bore you with all out photos and stories over a strong pot of tea! Your travel plans sound good and you are really going to like this lens while away, its incredibly flexible. I also haven’t used a lens this wide before – I will have to practise my composition with it a little. The old Panasonic FZ10 just sold on ebay. Can you believe I got US$151.00 for it! And to think I almost traded it in for CAD$80! Thats almost enough for another lens.